Canned 4/6/18; drank 5/18/18 @ the Yarchives. See-through orange/yellow appearance. A violent pour yielded a huge white head; strong, frothy lace. Dry wheat, sweat sock & faint grapefruit notes in the nose. Uh oh... Medium mouthfeel. Dry wheat & faint grapefruit flavors up front; mild sweat sock notes on the finish. I mourn the waste of whatever meager handful of galaxy hops that were uselessly slaughtered for this heinous brew; I hope no one forms an opinion of this glorious hop based on this monstrosity. Truly, a bad beer. Canned 4/6/18. Pours a slightly cloudy pale yellow with white that fades away quickly, minimal lacing. Got some citrus aroma when I opened it, but not in the flavor. If you like choppy beers, this one qualifies. I like it. 12 ounce can into tulip glass, canned on 4/5/2018. Pours slightly hazy pale golden yellow color with a 1-2 finger fairly dense and fluffy white head with great retention, that reduces to a nice cap that lingers. Nice spotty soapy lacing clings on the glass, with a fair amount of streaming carbonation. Aromas of big tangerine, grapefruit, lemon, peach, pineapple, passion fruit, papaya, mango, melon, white grape, berry, citrus peel/zest, light pepper, pine, wheat, cracker, white bread, herbal, and floral/grassy earthiness. Damn nice aromas with great balance and complexity of citrus/fruity/tropical/earthy hops and moderate pale/wheat malt notes; with great strength. Taste of big tangerine, grapefruit, lemon, peach, pineapple, passion fruit, papaya, mango, melon, white grape, berry, citrus peel/zest, light pepper, pine, wheat, cracker, white bread, herbal, and floral/grassy earthiness. Light-moderate pine, citrus peel/rind, herbal, grassy, spicy bitterness on the finish. Lingering notes of tangerine, grapefruit, lemon, peach, pineapple, passion fruit, papaya, mango, melon, white grape, berry, citrus peel/rind, pepper, pine, wheat, cracker, white bread, and herbal/floral/grassy earthiness on the finish for a while. Awesome complexity, robustness, and balance of citrus/fruity/tropical/earthy hops and moderate pale/wheat malt flavors; with an awesome malt/bitterness balance, and zero lingering hop astringency after the finish. Light-moderate increasing dryness from lingering bitterness. Medium carbonation and light-medium body; with a very smooth, moderately crisp, bready/grainy/sticky, and fairly resinous/rindy balanced mouthfeel that is fantastic. Zero warming alcohol for 6%. Overall this is an outstanding IPA! All around awesome complexity, robustness, and balance of citrus/fruity/tropical/earthy hops and moderate pale/wheat malt flavors; very smooth, crisp, and refreshing to drink with the modestly bitter/resinous/drying finish, never aggressive. Really impressive improvement over the original, a lot less malty. Galaxy, Mosaic, and Nelson Sauvin hops. Extremely juicy, vibrant, dank, and earthy balanced hop complexity; solid pale/wheat malt backbone, with no residual sweetness. A highly enjoyable offering, loved the hop profile as expected. This is an interesting, if random, AIPA. There are so many, and so many are trying so hard to distinguish themselves, but this one does a great job without trying too hard. It pours a pale yellow with largish bubbles. The hoppy aroma is pronounced on opening but subsides. The taste is strong, bitter, and tangy, but not overly so. It seems to deliver a lot of tastes without being over the top in any way. 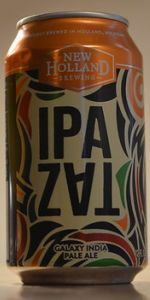 The hops flavors are pronounced and unique, dry, like many others, but in a different balance. You are left with a bitter taste that lingers nicely.